Yesterday I sat down to do some work on a couple of personal projects, and ended up reorganising my desk, and making a new laptop stand. You can see the final outcome in the photo below (go to the Flickr page to see annotations). 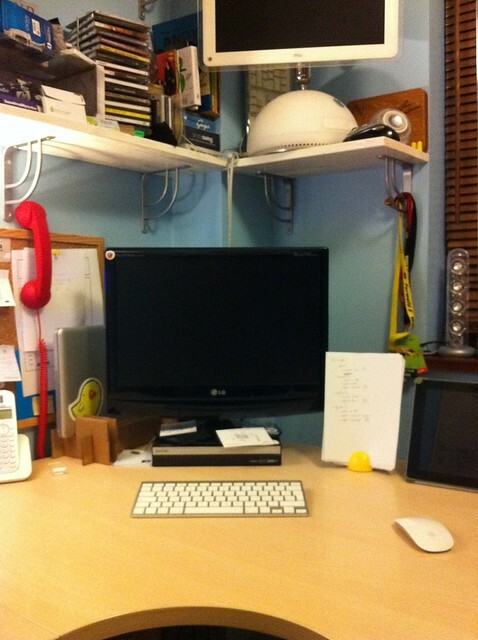 The main change is changing to a closed laptop stand rather than the open one, and a general reclaim of desk top space. In my previous setup my laptop sat to the right of the external monitor on an open stand. At first it was great, using a dual-monitor setup seemed to boost productivity—or at least reduce the wear on my switch spaces keyboard shortcut. But all-to-often I found my mouse and the laptop stand colliding. So yesterday I had the Saturday-whim to change things around. I'd seen the TwelveSouth Bookarc and half fancied Blue-Peter-ing something similar together. 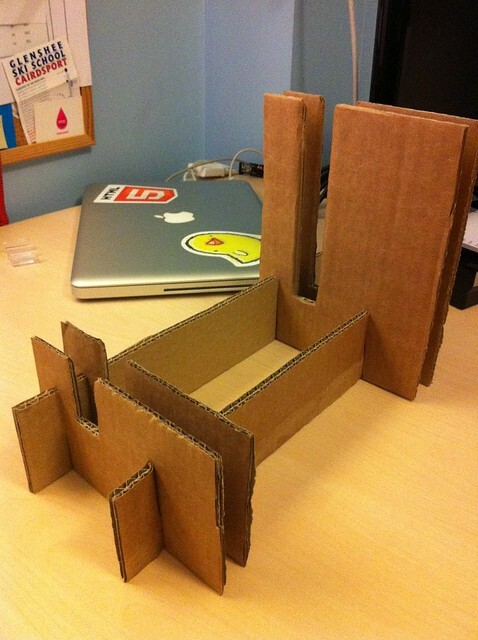 A cardboard box, stanley knife, ruler and around two hours later this is what emerged. My cheapskate closed laptop stand—aka Saturday afternoon! And I think it works pretty well. It sits to the rear left of my monitor now in a space that was pretty useless—due to the desk edge not being straight and leaving a tapering gap with the wall. My mouse now has endless space to frolic without obstruction. And it's had an unexpected but welcomed improvement to the acoustics of the room—I guess my laptop blocked one of the speakers. So far I don't miss the second monitor and don't think I will. I didn't realise but having them setup as I did reduced the resolution of my external monitor, and pulling windows between different sized screens was a pain anyway. Hey, it might have been a(nother?) pointless excercise in the art of procrastination, but a) I don't mind - it was fun :) and b) I don't think it was. Meta matters. Like removing distractions and annoyances, sticking to design or formatting standards, filling the space around you with inspiring or just things you like, don't have direct effect on the work you produce, I think they have an immeasurable effect on the work you can produce.